For several decades now, the women’s movement has successfully challenged traditional notions of the proper roles of women and men. Women have made major inroads into areas of life that were once the exclusive province of men: business, finance, law, broadcasting; even military service is open to women, and women’s roles in combat are expanding. There are still more men than women in most traditionally male professions, and more women doing traditionally female work. But in our society the gender barriers are no longer as rigid as they once were. This has caused us to do much soul-searching about what it means to be a woman and what it means to be a man. In this article we’ll focus on changing views of men and masculinity. Traditional models of manhood focus on strength and bravery. But there is more than one way to understand those qualities of character. A closer look at the essential nature of masculinity provides a new model of manhood that draws on the deeper realities of what it means to be a man. This new model of manhood offers a more stable foundation for boys and men who are seeking to understand their identity as males in a time of gender confusion, when the roles of men and women in society are changing under our feet. One of the most enduring models of masculinity is the model of man as a warrior, whose prime characteristics are strength, bravery, and skill in wielding the weapons of war. This ancient model of masculinity is found throughout the Bible, but especially in the Old Testament. In fact, there are so many bloody battles and wars in the Old Testament that many Christians prefer to ignore that part of the Bible, and focus almost entirely on the New Testament. 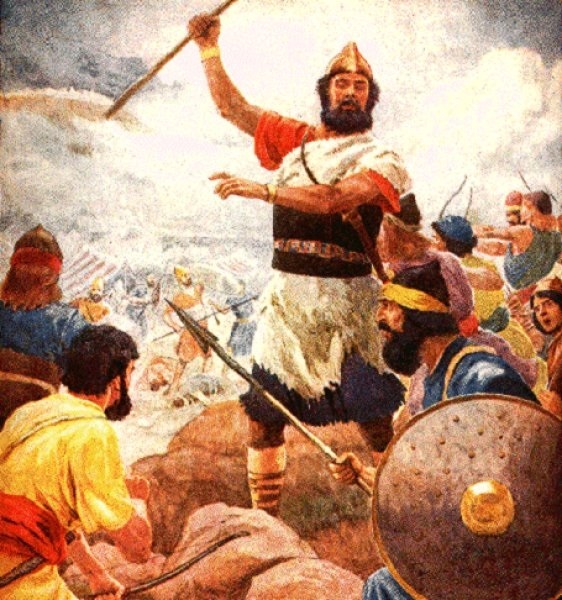 The battle of Jericho, recorded in Joshua 6, is a case in point. This was the very first battle after the Israelites crossed the Jordan and entered the Holy Land—and it was an especially indiscriminate and bloody one. The slaughter was not confined to enemy men of fighting age. The destruction of the city and its inhabitants was complete: men and women, young and old, even the livestock was put to the sword, and the entire city was burned to the ground. Only the silver and gold and articles of bronze and iron were saved, to be added to the treasury of the Lord’s house. We are left with the impression that the God of the Israelites was smiling down on this wholesale slaughter and destruction. Although such scenes are repugnant to many civilized people today, back in the era when this battle was recorded such conquests were an occasion for celebration, not apology. War was a fact of life. The destruction of enemies was seen as the will of God. The people of those times believed that national conquest was a divinely sanctioned activity, and that the enemies of their nation were fit only for slavery or death. Are men really all about war? This passage draws on a universal truth about war: War means the death of many human beings and the destruction of their homes and communities, not to mention great damage to the world of nature. The people who lived in more warlike times may have exulted in battle when they were on the winning side, but they knew its terrors and devastation when they were on the losing side. And some of them—especially when they were on the losing side—longed for a reign of peace, in which war would be a thing of the past. Many of us have this same longing, even as our nation continues to wage wars in various countries around the world. Some people long for the complete abolition of war, and the weapons and language of war, from human society. This longing becomes especially strong when we cannot even banish the weapons of war from our schools, and our places of learning are turned into battlegrounds. and finally to become a conquered nation subject to the great powers of Assyria, Babylon, Egypt, and Rome. Even the New Testament has its climactic battles in the Book of Revelation. How can we glean any redeeming social or spiritual value from this violent epic of human struggle? And how can the model it presents of man as warrior help us in giving shape to the new model of manhood that is developing in our time? What does it mean to be a man? What model of manhood can boys in our day and age look to? For Christians, this is the battle in which we must draw the sword that Jesus Christ puts into our hands. It is the battle over whether we will acknowledge Jesus Christ before others by living according to his commandments, or whether we will disown Jesus Christ before others by setting aside his teachings and joining in with—or condoning by our inaction—attitudes and actions that we know are wrong. And within that battle, there is a deeper battle over whether we will allow God or our own blind thoughtlessness to control our lives. Will we be ruled by the higher self that God gives us, or by the lower self that values only material and personal gain? As we consider these deeper issues of spiritual peace and conflict, we can begin to build a new model of manhood. We do this, not by closing our eyes to the old model of man as warrior, but by and opening our eyes to a deeper model of man as spiritual warrior. We can build a model of masculinity as strength, bravery, and skill in wielding the weapons of spiritual truth and genuine morality in the war against everything within and around us that tears down and destroys human life, and kills the presence of God’s love among us. This deeper model of manhood helped me through my own adolescence. I was young for my grade and small for my age—the quintessential skinny little “brain.” The model of big, macho masculinity just didn’t apply! For many boys who didn’t fit that rough, tough mold, living with a constant barrage of macho men on TV and in the movies meant growing up with deep-seated doubts about their own masculinity. Many boys today continue to struggle with this kind of self-doubt. Yet I was able to escape most of that self-doubt, not because I was better or smarter than any other non-macho boy, but simply because I had a deeper and more compelling image of what it meant to be a man. Despite the allure of the well-muscled warrior image of masculinity, I knew within myself that this was an external and temporary image of manhood. I knew that there are deeper qualities of manhood that were much more real, and that applied just as much to skinny little schoolboys and men who had aged beyond their physical prime as it did to those in the height of their physical prowess. Since the essential nature of masculinity and femininity is unknown, I will briefly explain it. Here is the essential difference: The inmost core of a male is love, and this love is covered over with wisdom. In other words, masculinity is love clothed in wisdom. The innermost core of a female is that masculine wisdom, and this wisdom is covered over with love. Here is a definition of masculinity (and of femininity) that does not depend on the outward, physical form, but relates to our inward form—to the parts of our being that make us truly human. It relates to the strength of love deep in the heart of a man. And it relates to a spiritual bravery and skill in expressing that inner love in wise and thoughtful ways that will bring improvement to our own life and to the lives of those around us. What is unusual and even startling about this definition of masculinity is that it looks past the traditional identification of male with intelligence and female with love—a definition that Swedenborg himself uses hundreds of times in his theological writings. Although the male does tend to express himself outwardly through the medium of intelligence, ideas, and physical skill, this comes from an underlying reality of love that is the essence of masculinity. Conversely, although women do tend to express themselves outwardly through love—through relationships, through compassion and connection with other human beings—within that outward expression is a core of wisdom that relates especially to understanding the human spiritual situation at a deep level. 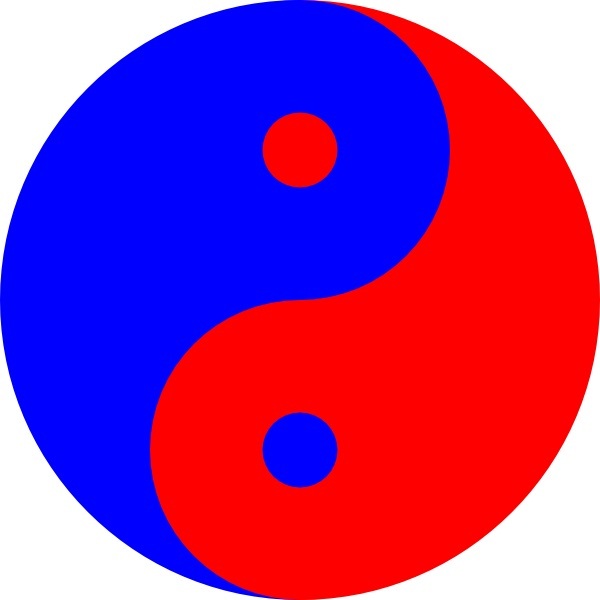 This image of male and female is expressed through the Eastern symbol of the yin-yang, in which the outward color of one element in the circle becomes the inward color of the other. For boys and men who are confused about their identities in a time of changing roles for men and women, this new image of masculinity offers a welcome relief. It provides a spiritual basis for allowing ourselves to express the full range of our character, rather than limiting ourselves to certain parts of our personality, such as intellect and competitiveness, that are traditionally associated with masculinity. We can understand that concealed within that rougher and less beautiful exterior, the true essence of masculinity is a deep and driving love that is placed in our hearts by God, and that motivates everything we do. Thanks Lee, I particularly enjoyed this one. I’ve always been fond of the quote, “The only thing necessary for the triumph of evil is for good men to do nothing.” This is true both externally and internally as we strive to better not only our world, but our inner selves. Glad you enjoyed it. Yes, great quote! Always good to hear from you.